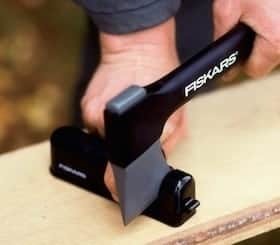 The Fiskars 7861 Axe, Hatchet and Knife Sharpener is an interesting tool in that there are very few pull through manual sharpeners for the large blades that this one accommodates. 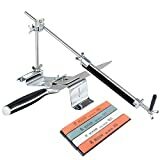 Generally, if you need to sharpen your axe, it is time to pull out the whetstone sharpener, or hand your tool over to be professionally sharpened. Not with the Fiskars 7861 sharpener. This is designed take care of your lumber tools. By simply inserting your blade into the slot, you slide the edge through and the ceramic wheels simultaneously sharpen each side. One would think with the unwieldy nature of the average axe, this would be slightly cumbersome. Not true – Fiskars sharpener is sturdy enough to hold still on your work surface, and the fact only a few passes are required to restore the knife edge, (depending on the extent of the dullness), it really is a very easy sharpener to use. A safety guard protects the user’s fingers as they sharpen-up, and the non-slip pads add to that feeling of stability. The tool really will not budge when in use. The guide system is set at a 30 degree angle, making it ideal for axe and hatchet use. 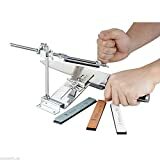 This does mean that the 7861 isn’t as convenient to use on standard knives however. 30 degrees is just too much and you are not able to adjust the angle. You wouldn’t want to use this on your favorite kitchen knife collection, put it that way. The shavings are collected within an easily accessible tray that opens on the bottom of the sharpener, making for an easy clean after use. The Fiskars 7861 Axe, Hatchet and Knife Sharpener is a fantastic product for looking after the large blades you store in the garden shed rather than the kitchen. It would be unwise to pull your expensive chefs knives through this tool. However, if you buy the tool with its main purpose in mind, you will not be disappointed. It is worth mentioning a little bit about Fiskars as a company. It is by far the oldest in the knife sharpener world. Established in 1649 as an ironworks in a fishing village in Finland, (Fiskars being the name of the village), there is no mistaking the heritage of the brand. The company is now a leading global supplier of consumer products for the home, garden and outdoors. Just head to the website and you will see that the company has offices all over the world, (it trades in more than 60 countries according to their company spiel). Very impressive.